UK Pro ET crew member John Byrne (right, above, with Joe Williams), aka Big John, died on 15th November 2012 after a long illness which he bore with his characteristic good humour and fortitude. A very popular character both at the track and away from it, John was unmistakable from quite some distance not just for his height but for his ever-present grin which lit up the most rain-sodden of days. He was the racer's dream, a hard-working and loyal crew member and always cheerful, and is going to be very badly missed. We have received the following tributes to Big John. To send your own tribute, E-Mail tributes@eurodragster.com. I had the pleasure and honour of building an engine for this man after he was introduced to me by John Atkinson. On that occasion, having been overawed by the shear size of John, my reply to "Will you build an engine for John" was "I’m not doing anything for you mate, you terrify me!". How wrong I was. John was one of life’s true gentlemen; a genuine gentle giant who added to the lives of anyone who came into contact with him during his all too short life. I’m only sorry he never got to use the engine, and can only say how much he will be missed. He certainly added a lot of colour to my life. RIP. Rest in peace Big Fella, you are sadly missed by more people than you know, you always had the time to talk and be friendly, RIP. RIP John very sad news. Never had the pleasure of meeting Big John. But when you read about the loss of another one of our drag racing family it's the very least I can do to pay my respect to someone who has the same passion as myself. Condolences to the family. You can now race on big John surrounded by some of the best we've ever had. RIP. Rest in peace Big John. You will be sadly missed but not forgotten. We will be thinking of you at the Pro ET Bash on Saturday. John we're all going to miss you immensely, you've been a great friend to me over the years, full of sound advice and always smiling. You always did have an advantage on the dodgems too ya big lump. 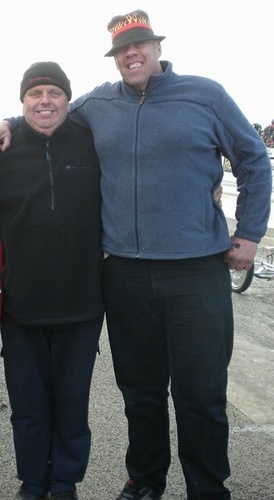 Rest in peace Big John, I couldn't have wished to have known a nicer guy. A very sad day for the drag racing family. You'll be missed, big guy. So sorry to hear the sad news. RIP big man, big heart huge character. Big John was a giant in more ways than one. Always ready to help anyone, a loyal friend, a true gentleman and a really good laugh in the pits. We cannot believe he's gone, but his smile, his bear hugs, his great sense of humour, will live on in the hearts of everyone who had the good fortune of knowing him. RIP Big John, we will always love you and remember you. We all knew Big John was ill and he fought it as hard as any man can, but it was just his time, that's all. We all knew and loved the Big Man and his love of life, his loss will be felt for a long time to come, especially Phil who has lost an irreplaceable friend. John was a Sportsman drag racer thru and thru, he came for the people, the racing and the competition, all the right reasons. John was genuinely respected for his level of commitment to Sportsman drag racing, but above all Big John was one of those larger than life characters who gave everything to the sport and never expected anything in return. We all consider an honour and a privilege to have had our lives touched by such a gentleman. Big John was one of us, God bless you.